I’m a sucker for a runny egg yolk and can’t think of many foods that aren’t improved by a river of amber yumminess running over them. So I’ve been obsessing about any recipes I see that involve eggs baked in tomato sauce. I knew if I served eggs in sauce with no carbs, my husband and children would go on strike. So I had the idea to mix pasta in with the sauce before adding the eggs. I knew the soft texture of the pasta and egg would need something crunchy to give the dish a really well rounded end result. So I made some easy but oh so good crunchy garlic breadcrumbs to scatter on top. Anyway, the result was so good and a hit with my children too. They did manage to make a huge mess eating it but I feel that is rather inevitable whenever you combine toddlers with spaghetti. If you are mess averse maybe use a penne shape instead. You can easily make the sauce in a big batch and freeze some so you can make this in super quick time next time. 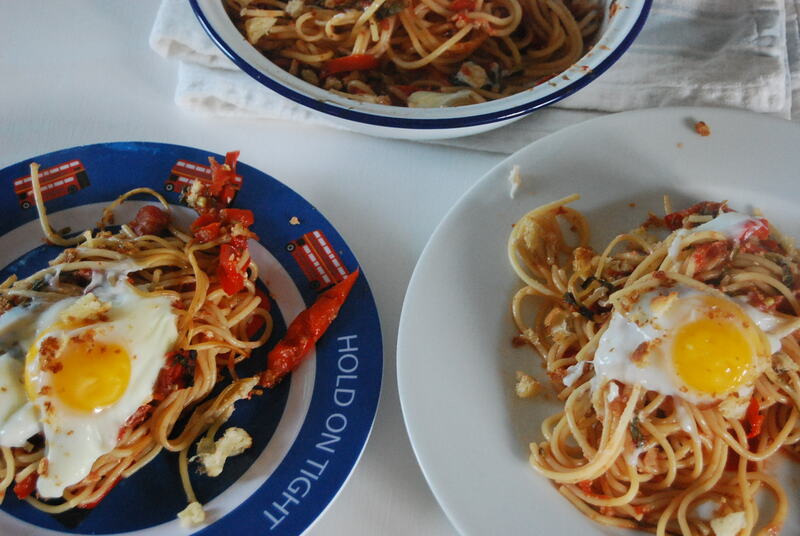 The sauce would also be great with chicken or fish or with some garlic prawns. If you are avoiding pasta you could use asparagus or courgette or zucchini noodles made with a Spiralizer like the one available in my shop. Half a baguette (or a few slices of bread) blitzed into rough breadcrumbs, not powder, in the food processor. Some crumbs the size of a grape are fine as they add great texture. Stir the pasta into the sauce until well coated. Add a little cooking water to help the sauce mix well. The pasta will continue to soak up the liquid as it cooks in the oven so it is a good idea to make the sauce a little watery looking at this stage. Put the pasta into a large shallow dish, I used a lasagne pan. Then use the back of a spoon to make 4 dips in the top. Crack an egg into each dip then carefully place into the oven. Cook for 15-20 minutes (depending on the temperature of your eggs) until the whites are set but still wobbly. They will continue to cook when you bring them out of the oven so it is better they come out of the oven very wobbly if you want a runny yolk when you come to eat it. While your pasta is in the oven, heat a large frying pan with the oil and smashed garlic and cook for around 3 minutes over a medium heat so that the flavour of the garlic infuses the oil. Then add the breadcrumbs and cook for around 5 minutes, stirring every few minutes until brown and crunchy. Add salt and pepper to taste and add chilli flakes too if you like. A little lemon zest is also good stirred through at this stage. 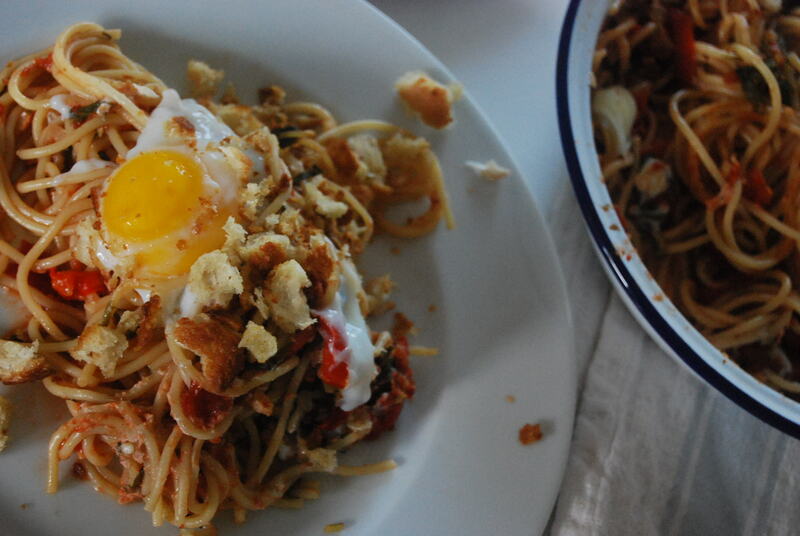 Serve the pasta so that everyone gets their own egg on top of their pile of pasta and top the whole thing with a scatter of crumbs and maybe a grating of fresh Parmesan. I’d love to see what you end up with, so remember to share this on my Facebook, Instagram, Twitter or Pinterest when you make it. Tag it #ystcook so I can see!